Guduchi, Tinospora cordifolia, is a climbing shrub with a succulent stem, native to India. 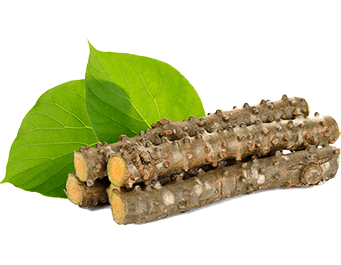 Also known as Amrit, Guduchi is a popular and valuable Ayurvedic herb known for its immune boosting and rejuvenative qualities. The main constituents found in Guduchi are alkaloids, diterpenoid lactones, glycosides, steroids, sesquiterpenoid, phenolics, aliphatic compounds and polysaccharides.